I hate it when I don't pay attention to my knitterly instincts. You would have thought by now I'd listen to my gut feelings when they start nagging away at me. Especially when I see and take note of all the red flags that pop up...and when it's about things you'd think I'd know better about by now. Like how stockinette likes to curl. Like how I even wrote in my Ravelry page project notes that the fabric is curling like a mofo. Like how I love a garter stitch border to prevent stockinette from curling. Like how random ridges within stockinette won't do jack to prevent curling. Nothing irritates me more than having to backtrack. And to re-knit something so simple due to my own errors. Yeah, I mentioned it recently that I think I've become a process knitter, but this isn't process. Oh no. This is just me constantly second guessing and doubting myself in every knitty step I take. I may seem like I know what I'm doing. I may seem like an intermediate knitter. But you know what? It's lies. It's ALL lies. I am none of the above. I'm totally faking it until I make it. Make it where, I don't know. I still view myself as an advance beginner. I'm no knitting expert. 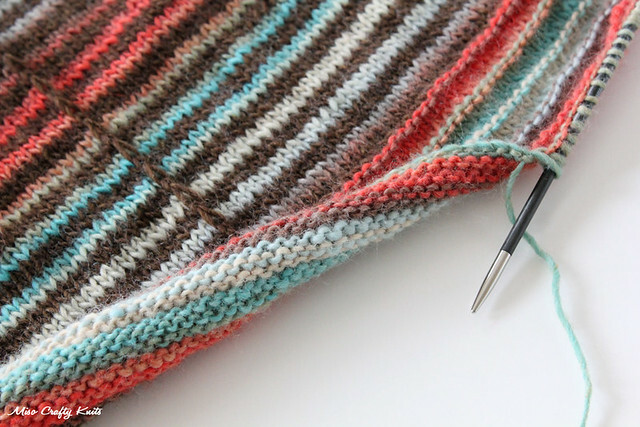 Although I strive to know as much as I possibly can about knitting, and trust me, there's so much to learn. But first things first: I need to learn to trust my own knitting judgement. For now, I'm just mentally finished with this project. Don't get me wrong, I've really enjoyed knitting on it. I think the knit is turning out beautifully. I absolutely love the pattern and have plans on knitting a few more (and I may already have the yarns bagged and ready to go!). But I'm just done with this project. After all, I went from planning on knitting the medium size to knitting the large, to knitting a little more in hopes of using up as much of the yarn as possible. And now, I've got to rip back about 3 inches of the border. I know, I know...this shawl isn't for me. I'm not wearing it. I'm donating this knit for the kiddo's school's fundraising auction. So why does it matter to me if the edge curls and rolls into one giant knitted log? For one, I'm proud of my work. Who wouldn't be when you put x-amount of hours into something? And two, someone is going to be giving their hard earn money in exchange for this knit. I don't want it to be something that looked pretty on display and then turns into a hot mess the second it arrives at its final destination. I don't want this knit to be the reason why the auction winner is turned off of hand knits. No. I don't want that to happen. I know, I'm a total over-thinker. I'm a "big picture" type thinker. This all drives me absolutely bonkers. I should just bind-off and be done with it. Instead, I'm putting this project in temporary time-out. I need to take a break from it before I attack it and start ripping out rows of knitting. Cause you know that situation never turns out well when you've been staring at the project for too long. So I'm putting it in time-out until next week. In the meantime, I think I deserve to cast on something new. Stockinette generally likes to roll a little, but I think the combination of stockinette and yarn is making the entire shawl roll up into a log. I managed to get the shawl to look flat enough for the photos, but any shifting I did made the whole thing roll right back up! I had read a few project pages on Ravelry where other knitters had this issue too. Oh well...live and learn? Maybe a turning ridge and a little folded hem? Or treat the rolling as a design feature? Totally sounds frustrating though! I don't think I would have been so bothered if it was just the hem rolling, but the entire shawl would roll up!! I've never had that happen before! It was frustrating indeed. 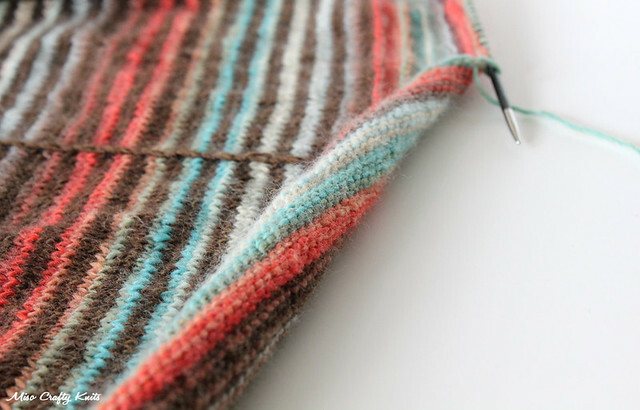 But I think I'll just rip out the border and do a simple garter stitch hem. That seems to be my go-to no-fail hem treatment for shawls anyways! I have the same problem - in fact, I'm experiencing it right now with one of my WIPs! I knew that not having a garter border would make it curl like crazy, yet I still insisted on following the pattern for some insane reason. Maybe now we will finally learn from our pain!! !